Lack of vitamin B6, is actually very rare. Because so many of vitamin B6 on natural food sources, or processed, making the case of vitamin B6 deficiency is rare. Vitamin B6 also known as pyridoxine. The main function of pyridoxine itself is to help the body's metabolism and also keep the nervous system (read more on the benefits of vitamin B6). It is most often the cause of vitamin B6 deficiency is not a person's body to absorb vitamin B with optimal. So vitamin B6 that there has been entered into the body wasted away without obtain benefits and usefulness. A common cause of vitamin B6 deficiency in a person is because the body is unable to absorb vitamin B optimally. Someone experiencing indigestion is usually experienced for those who are elderly. Making it less able to absorb vitamin B6 in the body. Then there are various kinds of drugs that can prevent vitamin B6 is absorbed into the body. In the form of antibiotics and corticosteroids. 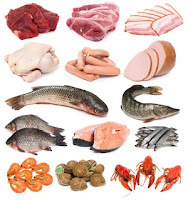 When the use of long-term, these drugs can interfere with the body organs such as the gastrointestinal tract, liver, kidney, so vitamin B6 are eaten in the natural resources would not be absorbed. Additionally excessive alcohol users, acute diarrhea, malnutrition, congenital derivatives are other causes which one can experience a deficiency of vitamin B6. Diseases caused quite a lot, such as pyroluria disease, which can develop into serious when someone is having acute deficient in vitamin B6. As a result, someone would come down with schizophrenia. In addition it is possible the disease when a person is deficient in vitamin B6 insomnia, irritability, fatigue, paranoia, depression, anxiety, lack of sexual drive, water retention, weight gain or even a quick ride fast down, problems in the conversion of sugar, problems with gait. In addition, someone who is experiencing a shortage of vitamin B6 will be anemic. Because the function of vitamin B6 itself is helping to form hemoglobin which can bind oxygen in the blood. So that when someone is experiencing a shortage of vitamin B6 will be anemic body. The initial symptoms certainly is fatigue. Although the cause of fatigue is very much, to detect that the body is deficient in vitamin B6 is also not known how uncertain. However, if you experience persistent fatigue for days, then consult a doctor to get proper treatment. How to prevent and even treat it? The easiest way is, to consume natural food sources that contain lots of vitamin B6. Additionally still consult a doctor. Because the doctor will examine you if there are any symptoms your body is not able to absorb vitamin B6 optimally. So do not take the initiative to treat yourself by buying a vitamin B6 supplement. Is because you can have excess of vitamin B6, or even such supplements do not help your problem at all. Addressing the problem of acute deficiency of vitamin B6, required hospitalization. Where there is an infusion of vitamin B6 in high doses. So vitamin B6 directly into the bloodstream and perform its function properly. Insufficiency in vitamin B6 can indeed cause many diseases. Moreover, the disease difficult to detect because many diseases caused by lack of vitamin B6 are associated with neurological diseases. So difficult to be detected by many people. Not to mention there is no clear sign of a person's vitamin B6 deficiency because it could have the same disease but have different causes. Protect yourself from a deficiency of vitamin B6 by consuming foods that contain a lot of vitamin B6. However, sometimes you can also take supplements of vitamin B6 to fulfill your needs may be unmet even though you eat foods containing vitamin B6. Sometimes problems occur due to deficiency of vitamin B6 of the child is not educated to consume a variety of healthy foods. So that the digestive organs are not well developed. This is seen when the child prefers instant foods, practical, and processed factories, compared with natural foods. To that end, teach children to eat healthy foods can help keep your child is not deficient in vitamin B6.